One of my goals is to learn at least one new thing every day. Once you get to a certain level in anything, it is easy to keep plodding along not learning anything new – and I don’t want that to happen to me. 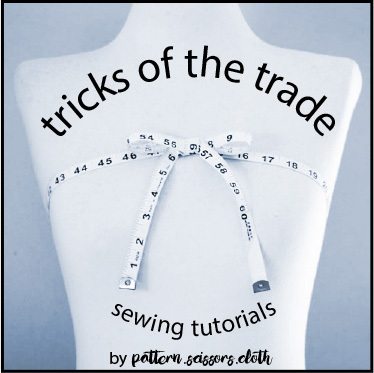 The ‘new thing’ doesn’t have to be a big thing, sometimes even the smallest ideas can be game changing – which is what these sewing tips are all about! Did you know: when sewing a curved hem, the narrower it is, the easier it is to sew? This 3mm double fold hem might look hard, but it is far easier than sewing a wider double fold hem – even in slinky fabric! When you go narrow on a curved hem, the difference in length between the cut edge and the sewing line is minimised. And so is any distortion – ugly things like twisting and roping will be a thing of the past. Allow some slight curvature for your body shape, taper smoothly towards the apex, and your dart will be savvy as. Need some piping to spruce up a project? Make your own! All you need are some bias strips of your fabric (try contrast for extra fun), some 3mm (1/8″) piping cord, and a zip foot. Fold the bias strip tightly around the cord and sew closely with the zip foot to create your own magic! I know this is not the most practical idea for the home sewer, but… long term, fabric is best stored on a roll, away from sunlight. I know this is not as cute as prettily folded pieces in a display cabinet in your sunny workroom – but hey, at least it won’t be permanently creased or faded along the fold lines when you come to use it! Try this technique, and you’ll never have to unpick a seam again because your stripes don’t match! Thanks for these tips. I will have to try matching plaids this way. It is so much quicker this way, and you don’t even need pins to get a perfect match! Ooo! I’m looking at that matching plaid technique now. I always do it an a slowly meticulous way and drives me crazy! I’m not going to say it changed my life… but it changed my plaid matching life! So quick and easy! Glad you enjoyed them Vicki! I believe the hand method is called slip basting, and might be in Clare Schaeffer’s Bridal Couture book? I love some hand sewing, but there are only 24 hours in a day! Thank you for sharing these tips, I was particularly impressed with the blood spot removal tip, I will be keeping that in mind. Did the saliva not leave a ring? Also, when you are stitching down the seam of the checked fabric, are you using a straight stitch? Thank you for this post. I have bookmarked it for future reference. No ring marks in that instance thank goodness! (I usually rub the wet/dry border and this minimises their occurrence.) For the stitching of the checked seam I am just using a standard straight stitch. And I know what you mean, there is nothing like learning under a great mentor! Thank you so much for sharing your expertise with the rest of us. Your blog is so helpful to me.